Australia Post is encouraging it’s business customers to get online, and we are helping them. On Monday this week I presented at a joint initiative between Australia Post and Google to try and help more small businesses get online. 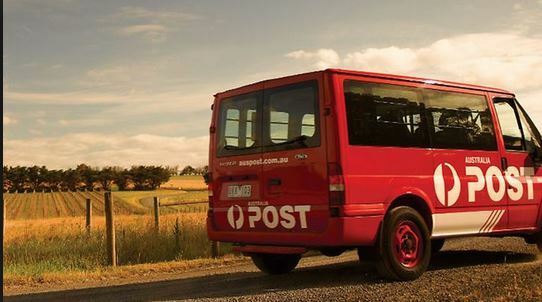 This is a priority for Australia Post because traditional mail is in decline and a huge proportion of their business is in delivering purchases from online retail. Their simple content management system for online retailers called “MyShopInABox”. Uniquely, for a CMS, you can pick up a copy at your local Post Office! Reply Paid Returns – a way of increasing customer confidence is to allow them to return goods to you free of charge. Online retailer StyleTread uses this to excellent advantage. They also covered a bit about direct marketing, and their ‘lifestyle’ survey of householders. I think you would be surprised at what Australia Post now offer, so if you are an Australian business, I would recommend getting on to their website and checking it out. One of the most interesting topics, for many online retailers in Australia, is the hot topic of free shipping, which Australia Post was well placed to discuss. I think this deserves its own post, so I will cover that separately. We’ve seen Nicolas’s favourite sites to follow, and now it’s my turn. To be honest, there is a bit of crossover. I love Smashing Magazine, I used to read Business Insider when it was Alley Insider, and I am on Econsultancy’s email listing. I think it is an absolute must for online marketers to subscribe to all the Google blogs relevant to them – and there are a lot! Here you can keep up to date about the latest in new features in Google. The Inside Adwords and Google Analytics blogs are particularly good, because there are so often changes to these products. 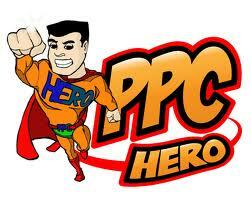 One PPC blog I do trust, and have for a long time, is www.PPChero.com. This was one of the first PPC blogs I found which was consistently updated with high quality content. They also have an SEO blog, but I don’t rate it as high, although it is still quite good. For SEO advice, I have to say SEOmoz.org of course. 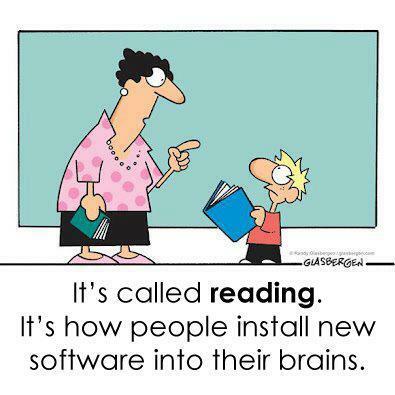 There is almost a paranoia about not reading SEOmoz, you’re wondering what you are missing out on. To be honest, I do stick to the main SEOmoz blog, and don’t really delve into the YouMoz blog that often. An SEOmoz offshoot, I love to read the blog from Distilled.net. Their articles are filled with creative, strategic link building and content creation ideas. I find it very inspirational. No lists of directories or ‘tricks’ here. For analytics there are two super experts I like to follow – Avinash Kaushik and Justin Cutroni. However, let it be known that these blogs are not for ‘quick updates’. These guys specialise in highly educational, in-depth posts, which you really need to set time apart to digest. Don’t skim through them. If you work with sites on WordPress – or even if you don’t – Yoast is a must read resource. He specialises in the niche of WordPress optimisation, and is the creator of many popular SEO-friendly plugins for the CMS. Ok, this is getting a bit long for a list of ‘favourites’, so I’m going to end it here with one non-online-marketing site. I read Inc.com for general business inspiration. If you work in business or marketing, reading articles on here is like a caffeine hit – it really gets me motivated about my own business and my clients businesses! Say hello to our new Facebook cover picture – the idea of which is to showcase our ability to help companies targeting international markets by providing multilingual SEO, PPC and other marketing activities. This is a new promotion for us, but it actually isn’t a new activity. We have been helping international sites optimise their sites in over a dozen languages since our inception in 2008…we just forgot to tell everyone about it, whoops. 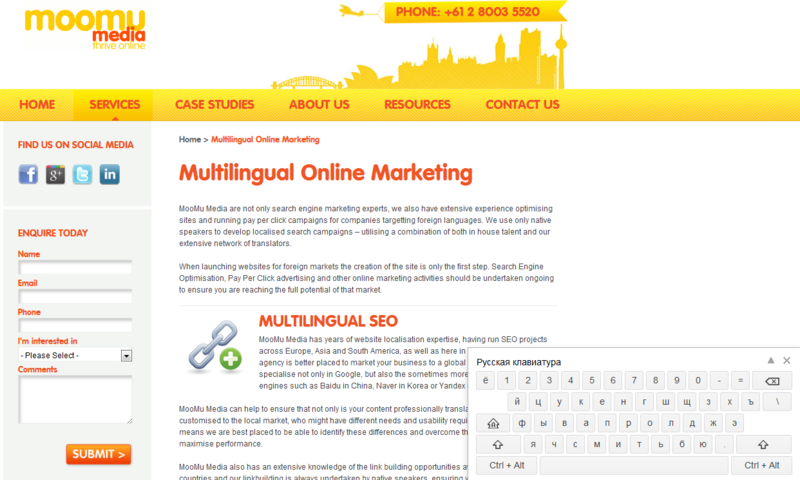 It seems like fate that around the time MooMu Media decides to promote it’s focus on multilingual online marketing, Google also promotes multilingual search through the release of Google input. Google has long allowed Chinese speakers to use Pinyin to type in Mandarin characters, but the release of Google Input has extended language typing ability to over 70 languages. You can switch between Hindi, Mandarin, Cyrillic and many others, with a simple click, and then switch back just as easily. Simply download the extension from the Chrome Store (for free), choose the keyboard you want, and then access it with a simple click in your browser, to see the keyboard on your screen like this. Now here I am typing in Russian, здравствуйте! Unlike the Google Pinyin download, you can only use Google Input to type within Chrome, and I guess Google means it particularly for Search. I actually had a bit of trouble using it in our CMS, where it would only allow me to use it in certain fields. Well, that’s fine, that’s why we have cut and paste! Our final ‘new’ thing to talk about is our series of ‘Weekly Topics’. We are going to be coordinating all our social media activity and blog posts to focus on one topic each week. We think this is a good way to dive deep into a topic each week, but of course it doesn’t mean we aren’t going to talk about big things when they happen! This weeks topic is multilingual marketing and languages on the web, because we are celebrating our new ‘re-brand’ as a multilingual online marketing agency. Next week’s topic will be Advanced Google Analytics – following the excellent seminars we attended yesterday at the Google Sydney Engage programme – we have learnt a lot and can’t wait to share it with you! We have a lot of ideas for upcoming weeks, but if you ever want to suggest an idea, no problem! Just hit us up on Facebook, Twitter, Google + or right here in the comments.